If you have ever heard anything about Dyson vacuum cleaners, you are probably already aware of how amazing they are. The Dyson name has built a solid reputation over the past 40 years they’ve been around, and with the Dyson DC 25 Animal upright vacuum cleaner, they continue on in the quest of providing amazing vacuum cleaners that really get the job done. Continue reading if you would like to know why this vacuum earned a spot on our Top list. The Dyson DC 25 Animal Upright Vacuum Cleaner, a specialty multi-function upright canister vacuum cleaner especially popular for people with pets. The DC 25 Animal from Dyson is a very special vacuum cleaner, especially in homes with one or more pets. The brushbar features powerful bristles that quickly and efficiently remove pet hair and dirt from the carpet. Use the included turbine head and you can also remove pet hair and dirt from stairs, your car, upholstery and more. The Animal offers a 16-foot telescopic wand that actually attracts dirt to it so you can rest assured that all of the dirt is completely removed from your floors. And, with Root Cyclone technology, all of the dirt goes inside of the machine instead of inside of your air. With spinning action, this technology also helps ensure the vacuum never loses suction or clogs. 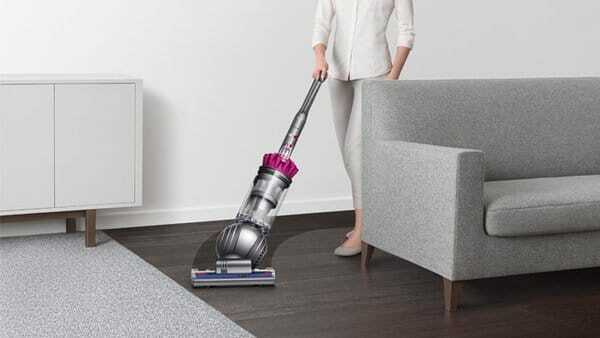 Backed by Ball technology, Dyson’s signature technology, the Animal 25 is easy to use and easy to maneuver around the house for easier and more efficient cleaning while also eliminating missed spots in the floor. A washable HEPA filter is also included inside of the Dyson Animal. The HEPA filter lasts the entire life of the vacuum cleaner and traps microscopic allergens that can cause your and your family sickness. With up to 150 times less bacteria and mold in the air after using this cleaner, you can confidently use the machine. It is certified by the Asthma and Allergy Foundation of America. If you want to purchase the Dyson DC 25 Animal, be prepared to spend big. However, you can be certain this is money well spent, as the cleaner will never fail to meet your expectations or deliver quality time after time. It offers thorough cleaning of your home’s floors time after time while always delivering the positive attributes that you look for in a vacuum cleaner. There are many more exciting qualities that you can appreciate about the Dyson DC 25 Animal. How about the 1/3 gallon hygienic bin that can be emptied without ever touching the dust? It takes just one push and you can empty the container and be ready to vacuum again. There are fingertips controls on the vacuum cleaner as well as on-board accessories and tools including a stair tool and a combination tool. The Animal is lightweight so that it can easily be moved from one area of the home to the next, and is powerful enough to handle all types of carpet with ease. With a 5-year warranty, the Animal is a cleaner that you can purchase with complete confidence. Amazon customers gave the Dyson Animal DC 25 4 out of 5 stars. There are many positive reviews found here as well. As you can see, the Dyson Animal DC 25 has many things to love. It is one of our top choices because it makes vacuuming much less of a hassle while providing fast and efficient cleaning of the floors.